This CupCake CNC frame was made entirely out of plastic printed on a CupCake CNC. Awesome. 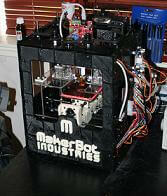 Makerbot‘s 3D printer is starting to clone itself. Earlier this summer, Christian Arno (aka Webca) used the CupCake CNC to print out the frame for…another CupCake CNC. Usually made of wood, Webca’s printer frame was built entirely of the plastic that the CupCake CNC uses for printing, held together by copious amounts of hot glue. It took Webca a month of solid printing to create the parts. Judging by the comments on the Makerbot blog, this is the first time that someone has made a CupCake CNC frame entirely from CupCake CNC manufactured plastic pieces. This isn’t true self-replication (the electronic and metal components weren’t printed by the machine) but it is an awesome step in that direction. Makerbot has joined RepRap in the ranks of devices that can (partially) copy themselves. Long live the self-replicating open source 3D printer revolution! Makerbot’s CupCake CNC is an open source project, and as such the specs for building it have been online for some time. Generally, however, those who want to build their own CupCake CNC are expected to assemble its frame from pieces of wood (typically cut out with a laser cutter). Webca constructed a layer by layer model of the CupCake CNC frame so that he could print the pieces out instead. His designs (along with more pictures) are available on Makerbot’s community website dedicated to 3D printing projects (called Thingiverse). Webca’s accomplishment is made all the more impressive by the fact that he is just an enthusiastic user – he’s not affiliated or employed by Makerbot Industries. Yet he has done what (apparently) no one there had the time to do: give the Makerbot community the ability to replicate the machine using it’s own printing. There are still major hurdles to be cleared on the path to self-replication, however. Few printers (including the CupCake CNC) can create more than plastic parts. While we have seen stainless steel printing, most metals are still far from accessible, and the semi-conductors needed for printing electronics seem many years off (though some progress is being made there too). Also, none of these printers come equipped with robotic arms, and until they are you can expect that every ‘self-replicating’ machine is still going to require a lot of human labor to assemble. Will that labor be worth it? Self-replication is really the Holy Grail of 3D printing. When it is finally accomplished, users will be able to make machines for their friends, spreading the use of the devices like a virus. They will also allow individual users to generate entire swarms of the devices for their own use. It’s unclear, however, what purpose those machines will have in our homes. The capabilities of these devices are likely to be limited, even the advanced generations of CupCake CNCs and RepRaps are unlikely to exceed the manufacturing prowess of true commercial factories. Even when your friend can make you one, household 3D printers may simply stay as they are at the moment: a really fun hobby. Or they could give us a flexibility in creation and shared production that could have a serious impact on how we buy cheap goods, even how we make art. For now, it’s just cool to see that open source projects like Makerbot are inspiring users in amazing accomplishments that elevate the community as a whole. Kudos to Webca, and I can’t wait to see who prints a CupCake CNC next.